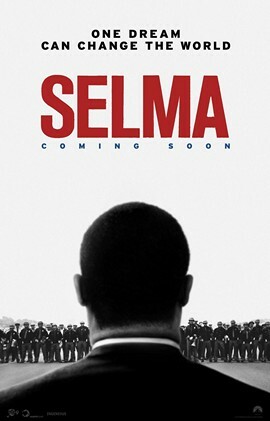 Selma, directed by Ava DuVernay based on a screenplay by Paul Webb and DuVernay, depicts the struggle for voting rights in Alabama, which resulted in the passage of the Voting Rights Act. Although the film is about historical events, it has a topicality due to the recent undermining of the Act and the efforts to disenfranchise black voters in some states. The script is highly didactic. Almost every scene seems to drive home a particular point. Many of the scenes consist of two or three people talking, in which they present contrasting points of view. This can be effective at times, but it becomes a drawback in the scenes between Martin Luther King (David Oyelowo) and his wife, Coretta (Carmen Ejogo). The two of them sound so high-minded and professorial, that one wonders how they didn’t drive each other crazy. Selma touches upon King’s complicated attitude towards violence. It makes clear that one of the aims of non-violent resistance was to provoke a violent response from authorities, in order to cause them to lose legitimacy in the eyes of the world. The film shows King struggling with the possible consequences of this tactic. In one scene, he calls off a march -much to the consternation of his supporters – because he fears that the police have set a trap. Selma is a timely film that everyone should see.